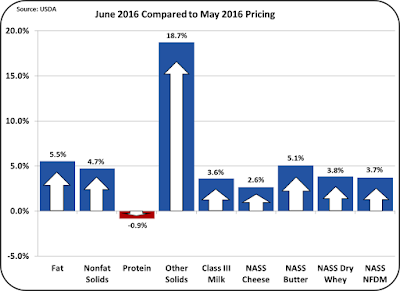 June milk and component prices were announced on June 29. Prices were mostly positive with only milk protein being slightly lower. 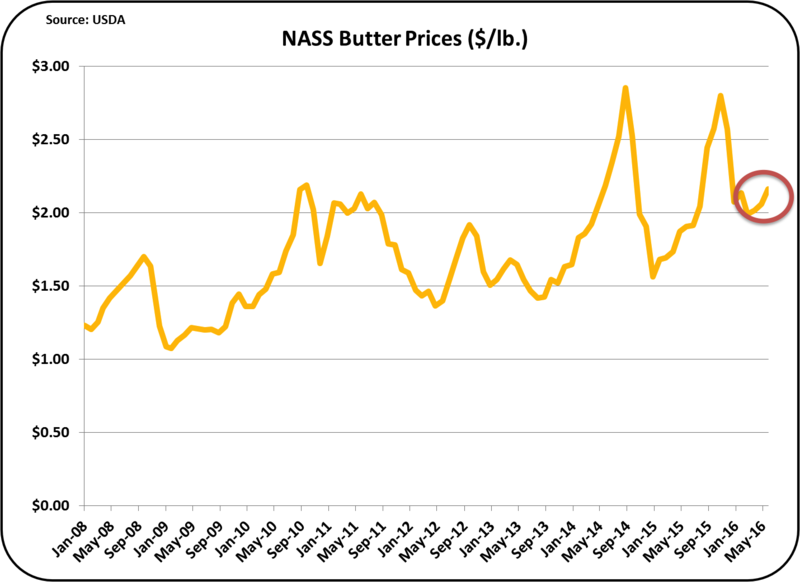 The lower milk protein price was caused by the 5.5% increase in the value of butterfat. See the September 15, 2015 post for an explanation of this relationship. The Class III price of $13.22/cwt. 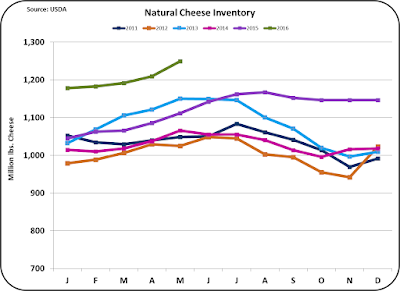 is still very low as many of the same long-term issues concerning dairy prices continue to hold prices down. 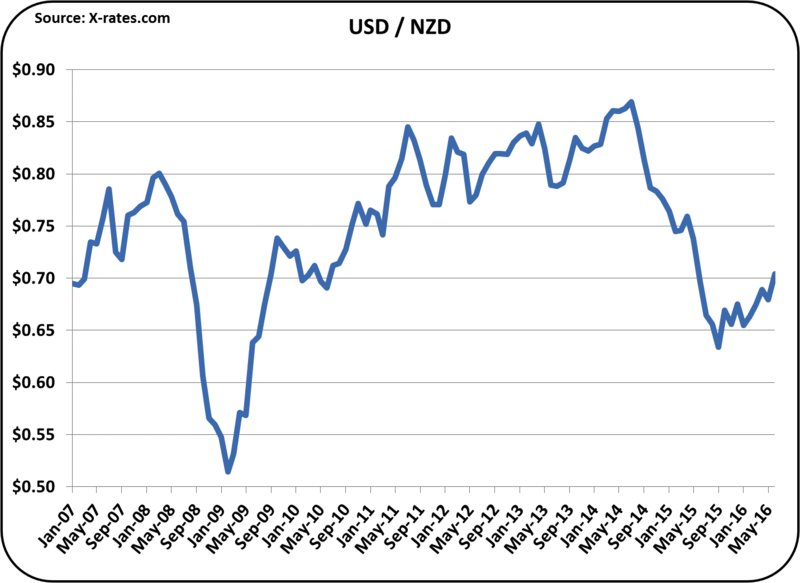 Inventories are high, exports are low, and competitive global prices remain low. In this issue, the following items will be reviewed. 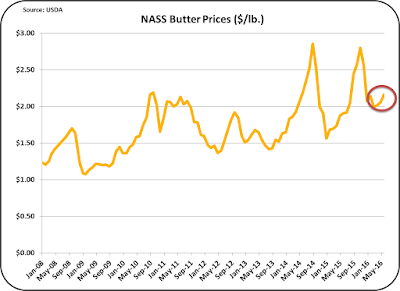 One of the surprising price increases was the price of butter. 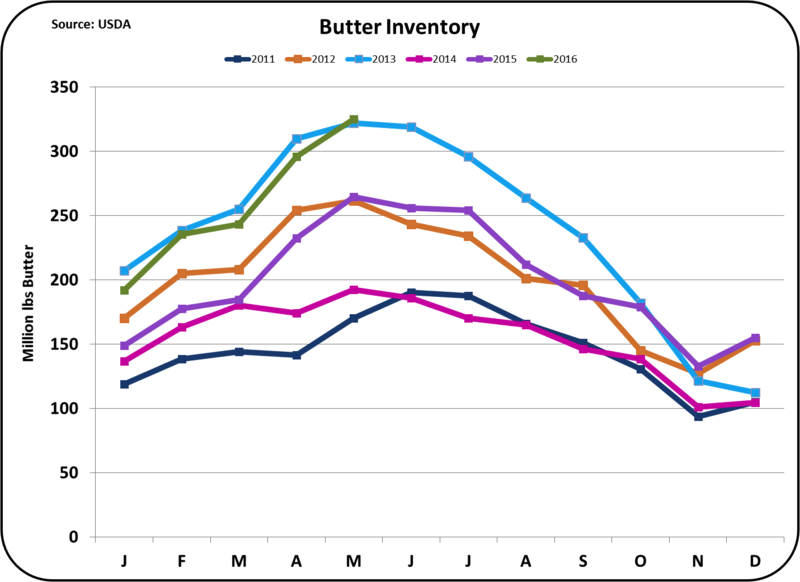 It increased by 5.1% in spite of an increase in domestic butter inventories and low global prices. 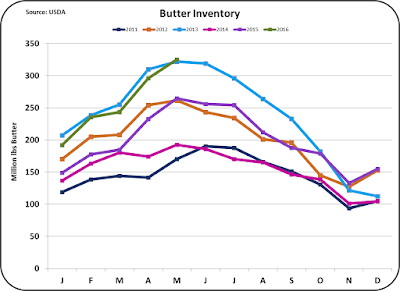 The only other factor that can explain the increase in butter prices is the decrease in butter imports in the months of April and May which could be interpreted as a leading analytic for lower future butter inventories if these imports remain low. 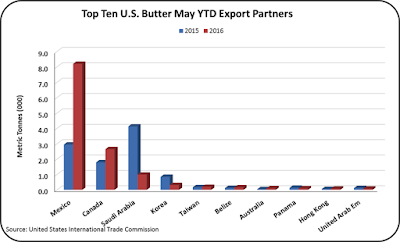 Because international butter prices are significantly lower than U.S. butter prices, exports are almost impossible. The only significant butter exports are to Mexico. This is primarily branded products. 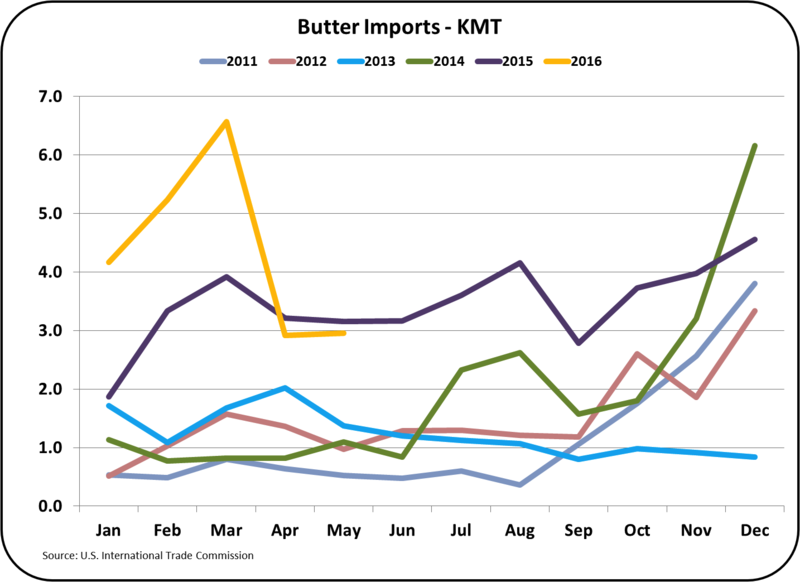 However, on the flip side, butter imports from Mexico are well up compared to the prior year. 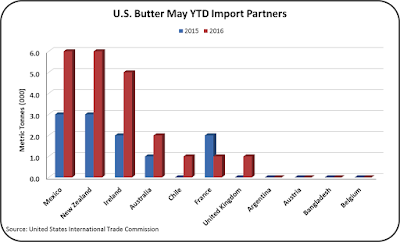 These imports are much cheaper than U.S. bulk butter. 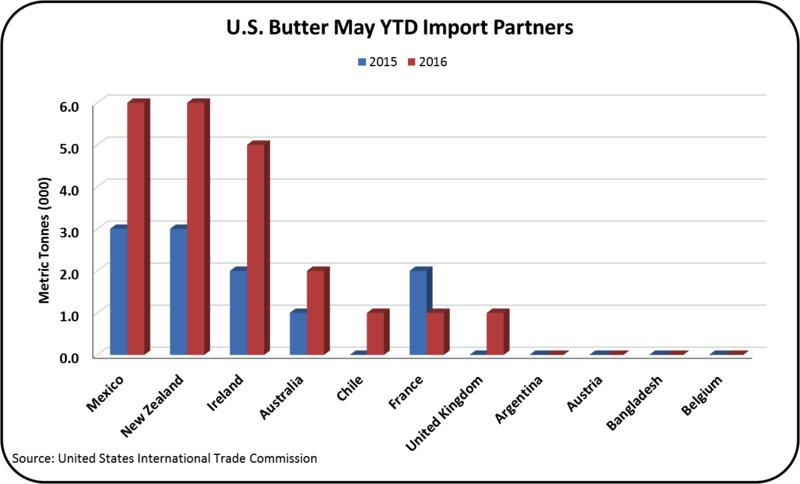 Through May, YTD, butter exports to Mexico are about eight thousand metric tons while imports from Mexico are six thousand metric tons. 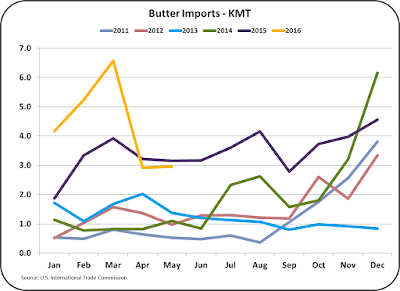 Although details are not readily available, this appears to be purchases of U.S. brands going into Mexico, and bulk butter going from Mexico to the U.S. 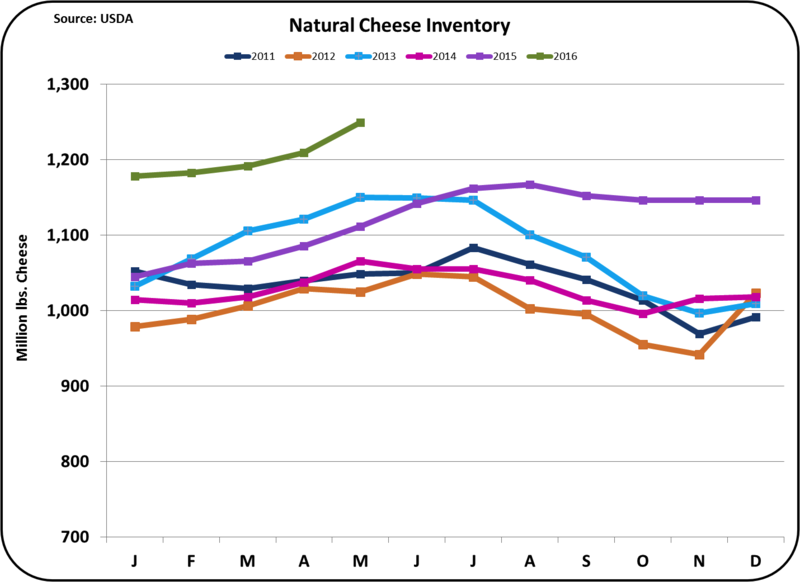 Cheese production has slowed down slightly, but inventories are still high. 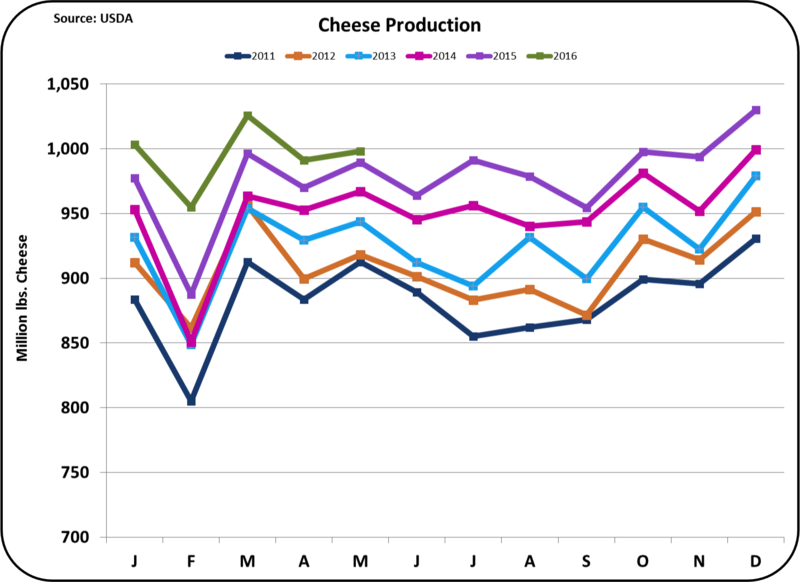 The charts below show cheese production and inventories. 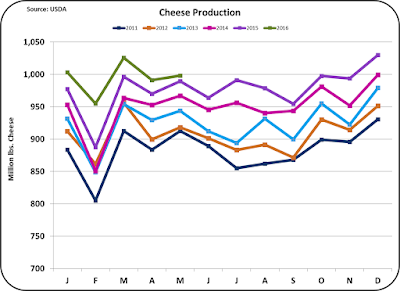 Cheese production has slowed down slightly compared to 2015 but is still at record levels. 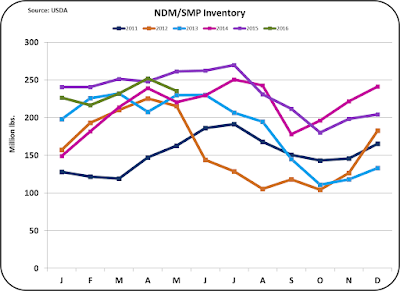 Inventories as shown below, are reaching record levels with no letup in the pace. Typically this would cause butter prices to decrease, not increase. 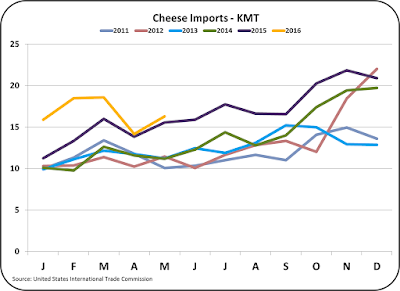 Cheese inventories are being pushed by record imports and anemic exports as shown in the chart below. 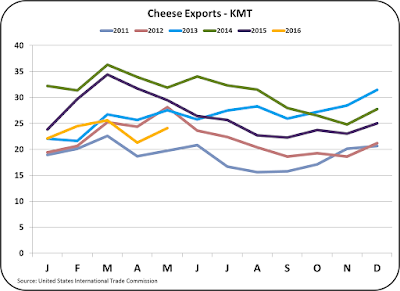 The continued decrease of net cheese exports (exports minus imports) with no significant decrease in production is swelling inventories with no end in sight. Nonfat dry milk is a major export item for the U.S. dairy industry. It is also the basis for pricing Class IV milk that can, in turn, determine the price of Class I & II milk. 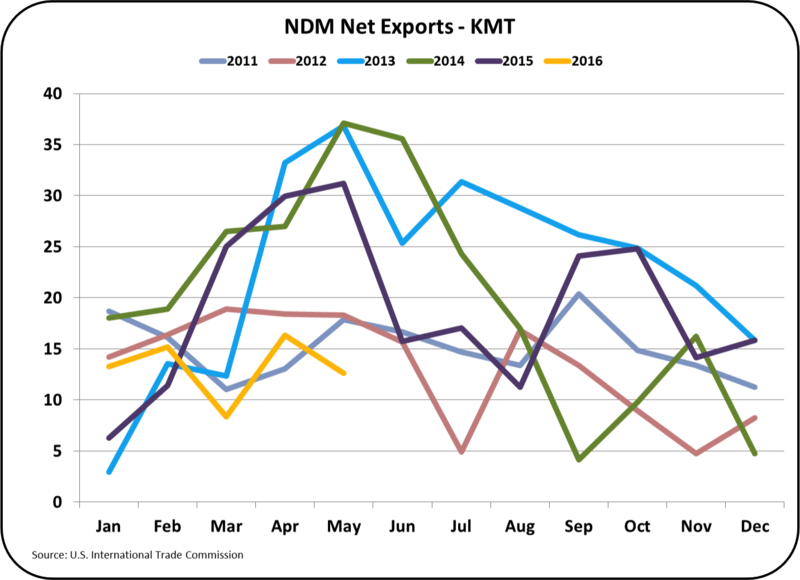 Unfortunately, net exports are lower than the five previous years. 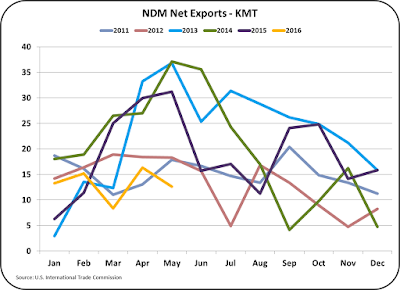 In spite of the decreasing net exports, inventories have remained at normal levels as production has slowed down. 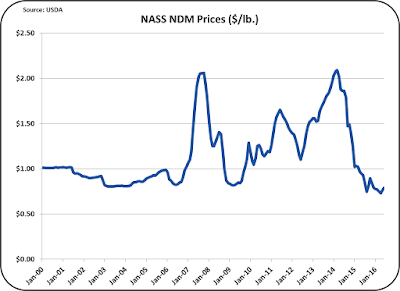 NDM prices are really determined by global prices, which are stable. 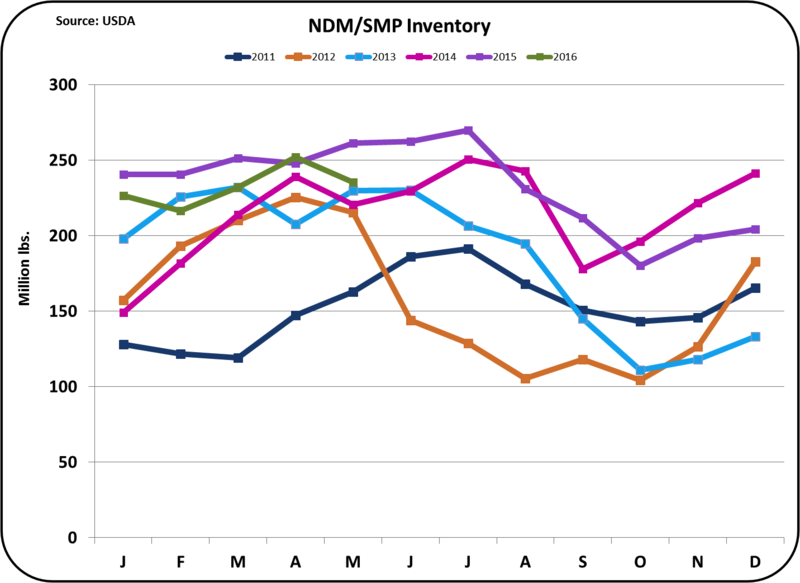 The stable global prices, combined with the "normal" level of U.S. inventories has kept U.S. NDM prices low, but stable. Because of the stable price of NDM and the low price of cheese, Class IV milk was more valuable than Class III and became the basis for the majority of milk prices in June. 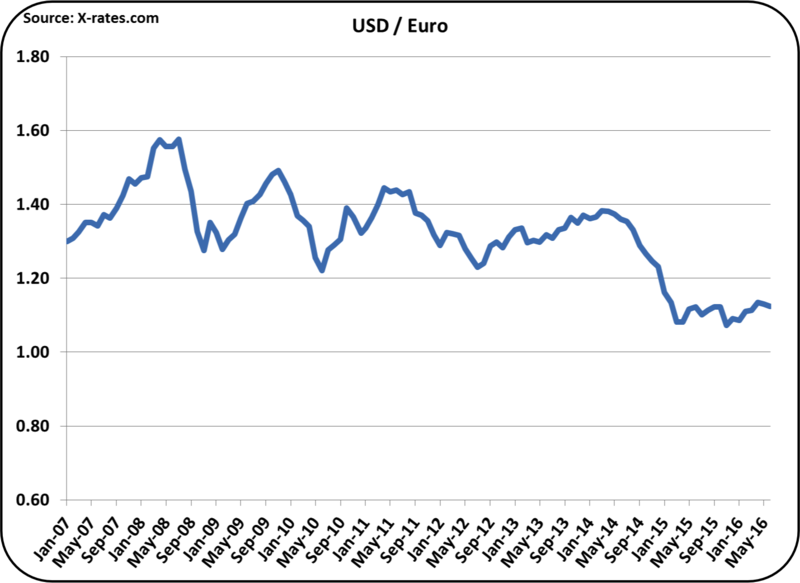 In the prior post on the impact of Brexit, a weakening of the Euro was mentioned as a downside for U.S. dairy prices. 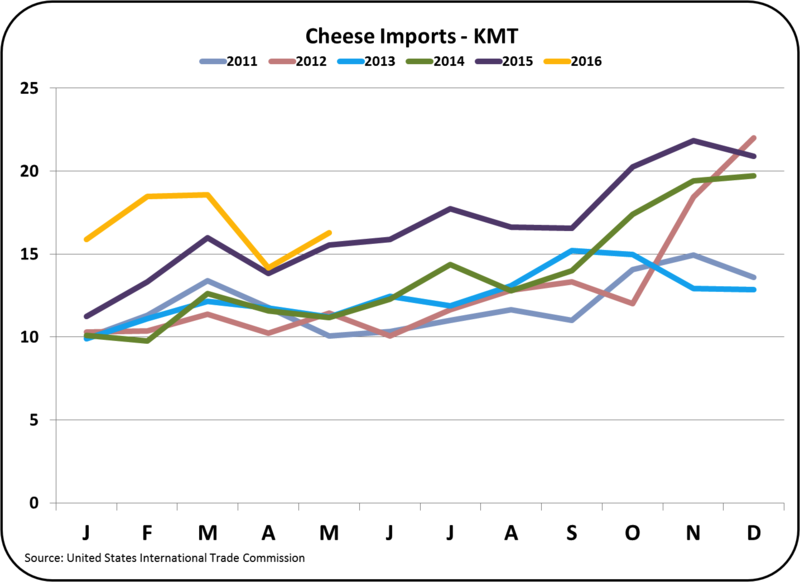 A weaker currency makes European cheeses less expensive on the international markets. 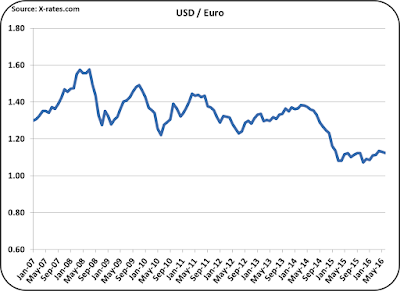 Although it is too early for Brexit to have any real impact, the anticipated and emotional impact appears to have already lowered the value of the Euro slightly. Zealand exports. 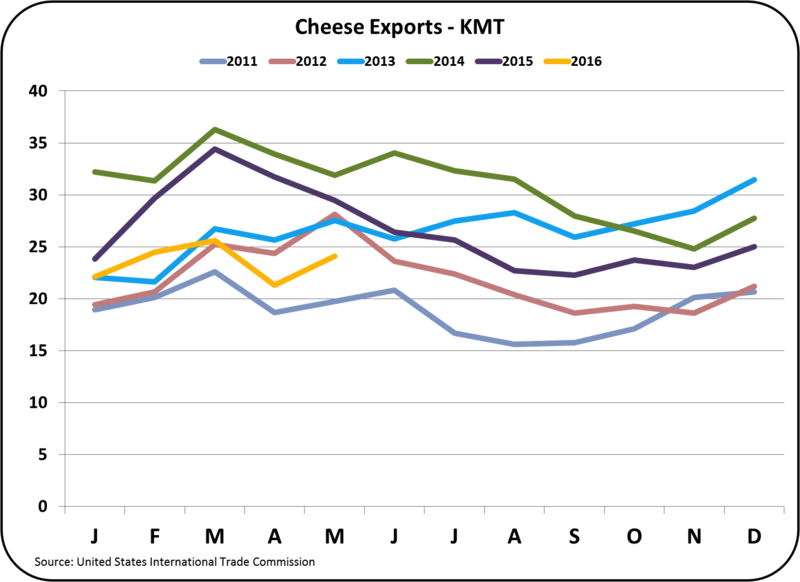 Much of the lost cheese export business involves U.S. exports to South Korea and Japan that was taken primarily by New Zealand. 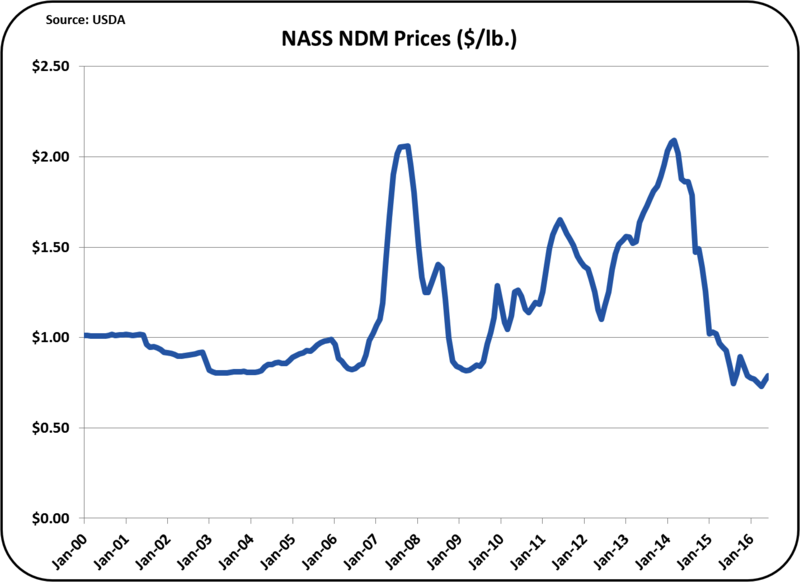 Overall, the multiple dynamics do not suggest any major changes in milk prices. Changes appear to be well into the future. Stay up-to-date as new events are followed in the blog.